I-It’s not like I’m being cute for you, okay!? 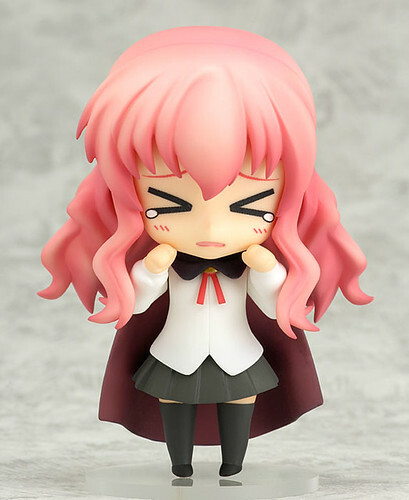 The third season of the popular Zero no Tsukaima anime has recently come to a close, but a Nendoroid of Louise is back for more in this figure planned by the online hobby site “HOBBYSTOCK”, and assisted by Goodsmile Company! Both her angry face and her cute face are included, as well as a crying face which was included due to being the most popular expression on a poll preformed online. Her magic wand and whip that were seen often in the anime are included, as well as “The Progenitor’s Prayer Book”. All the added extras make it easy for fans to display Louise in any way they want to see her! This entry was posted in News and tagged louise, nendoroid, zero no tsukaima. Only for residents in Japan? It hurts me!